The protagonist of our game needs help to dress appropriately and also to choose clothes for the holiday where she will go with her friends. The place they chose him as a tourist destination is one where the sun shines and warms you thus need some advice. 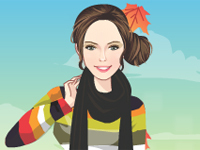 Choose clothes that you think they go and match fall season. Be with this young lady and find something special to be comfortable and beautiful. Have fun with this lady.